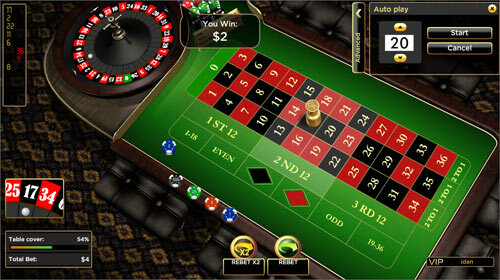 In European Roulette Pro, players wager on either a single number or a range of numbers, on the red or black, or on odd or even. To determine the winning number and color, a croupier spins the Roulette wheel and rolls a ball in the opposite direction. The ball eventually falls into one of 37 numbered and colored pockets on the wheel (numbers 0 to 36). Inside Bets are bets placed on numbers straight up or on a line that separates numbers and comprises a group of numbers. Outside Bets are any of the bets placed in the external area of the number table. 1. Choose a chip value. All of the special features available in European Roulette Pro are located in the Advanced Panel. To open the panel, click on the Advanced tab in top right corner of the game screen. 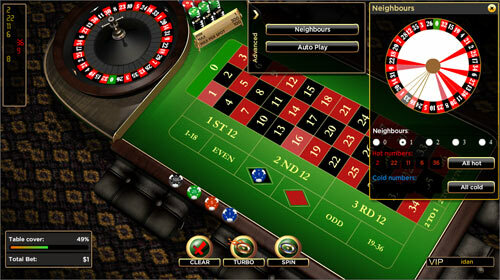 Neighbor Bets allow players to wager on numbers that appear next to a certain number on the Roulette wheel. For example, a Neighbor Bet on 12 would include 12, 28, (the neighboring number on the left), and 35 (the neighboring number on the right). Players can place Neighbor Bets on up to 4 numbers (the four numbers that appear adjacent to a number on the left and on the right sides). 1. Click on Neighbor Bets in the Advanced Panel. 2. Click on the number of Neighbor Bets on which you wish to wager (1 – 4). 3. Scroll over the Roulette Wheel image to preview the bet you wish to place. 4. Click on the number you wish to bet on. Chips are placed on all relevant numbers. The Neighbor Bets window will always showcase the five numbers that have won the greatest number of rounds (Hot) and the five numbers that have won the least number of rounds (Cold). Players can quickly and easily bet on one or all five Hot or Cold Numbers from the panel. Every number on the Roulette wheel is categorized by a level of 'hotness' or 'coldness'. 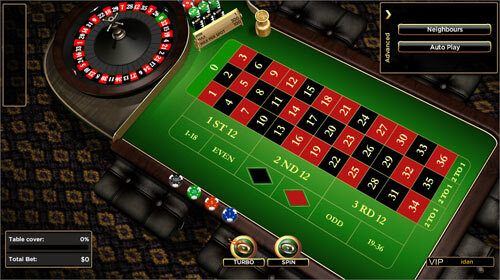 This information is illustrated on the Advanced Panel by designated colours that fill the pie-shaped space below each number on the Roulette wheel. Clicking on All hot or All cold will place five chips on the table – one for each number. If two numbers were called the same amount of times, the number that was called last is considered hotter. The five coldest numbers are displayed only after enough spins occur for them to be determined. Hot and cold numbers are determined per session only. This feature allows you to automatically play a chosen number of successive game rounds without having to place your bets and click on the Spin button each time. 1. Click on Autoplay in the advanced panel. 2. Choose the number of spins you want to play automatically. The autoplay feature allows you to automatically play a chosen number of successive game rounds without having to place your bets and click on the Spin button each time. Straight Up: Place a bet directly on any single number. Split Bet: Place a bet on the line between any two numbers. Street Bet: Place a bet at the end of any row of numbers, covering three numbers. Corner Bet: Place a bet on the corner where four numbers meet. Line Bet: Place a bet at the end of two streets on the line dividing them. A line bet covers all the numbers in either street, for a total of six. Dozen Bet: Place a bet in one of the boxes marked "1st12", "2nd12", or "3rd12", each of which covers twelve numbers. Column Bet: On the short side of the roulette table are three boxes marked "2 to 1". By placing a chip in one of these boxes, the player selects all twelve numbers above it (excluding 0). 1-18 / 19-36 (High/Low): A bet placed in one of the boxes marked "1 to 18" or "19 to 36", covers 18 numbers. Red/Black or Even/Odd: A bet placed in one of the four boxes, on the sides of the board, covers half of the numbers on the board, as described in that box. The zero is not covered by any of these boxes. Each box covers eighteen numbers. Trio: a bet on 0, 1 and 2; or 0, 2, and 3. The chip is placed at the intersection of the three desired numbers. Top line: a bet on 0, 1, 2, and 3. The chip is placed either at the corner of 0 and 1, or on the corner of 0 and 3. In case of multiple wins, all wins are paid together. The premium version of this game has the same rules and functions. The Low Stakes version of this game has the same rules and functions.